Barcelo provides hotels in many destinations across America, Europe, Africa and Asia including Mexico, The Dominican Republic, Cuba, Spain, Italy, Portugal, Germany, Morocco, Egypt and the United Arab Emirates. Barcelo offers various themed hotels and resorts that specialise in weddings, diving experiences, golfing and couples. They also have beach hotels, pet-friendly hotels, luxury hotels, hotels with premium levels and casinos, family hotels and large resorts. Barceló also offers resort credit that allows enjoying incredible discounts on things like spas, hiking, wine and unforgettable romantic dinners. If you’re looking for holiday packages you can discover many of these at Barcelo. Find flight and hotel deals, last minute breaks, beach breaks and city breaks as well as pre-made package holidays. If you’re looking to host your wedding in a luxury resort somewhere abroad then pick Barcelo Hotel Group for the very best wedding planners and settings. Hand pick your resort location whether that be in Mexico, the Dominican Republic or any other stunning beach or city destination. You can also choose your hotel or resort based on a theme to find a charming hotel that has all the features and amenities you’re looking for to keep you and your guests happy. Barcelo also offers wedding packages that include wedding decor for the reception, food for the dinner and plenty more extras to make your day that little bit more special. Design your entire day and let the Barcelo wedding experts know exactly what you want so they can bring your dream wedding to life. Discover all the information and advice you could need in the Barcelo blog. Here you can find articles on top destinations like Andalusia, the Canary Islands, the Balearic Islands, Mexico and the Dominican Republic. Read up on what to expect in each destination as well as travel tips for each place. You can also find information on lifestyle topics like culture, beauty, sports, children and nature to help you find the best destination and resort possible for your next holiday, special event or wedding. If you’re into food you can also discover a lot of essential info on all things food and drink in all of the destinations where there are Barcelo hotels in the gastro section. Read articles on the best restaurants in Mexico, the best places for dessert and much more. You can also read influencer stories to see what other customers think of Barcelo hotels and it’s amenities. How can I contact Barcelo? If you need to contact Barcelo please use the contact form here. If you need to cancel your stay with Barcelo then please contact them using the contact form on their website. Yes. Find all the information you need to book your stay here. The Barceló Hotel Group is made up of more than 240 hotels in 22 countries making it one of the leading tourism companies in the Spanish market, as well as one of the most important in the world. Barcelo provides luxury hotels in locations all over the world as well as package hotels and flights, they also cater for weddings and events of all sizes and budgets. 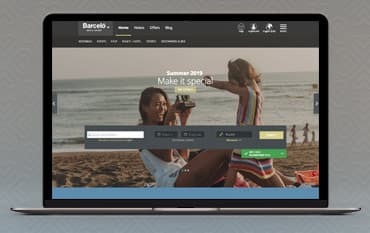 Book your hotel with Barcelo online and make sure you use a Barceló discount code from us to save money on your next stay. You can also enjoy great savings in the offers section and when you sign up to become a member. We are constantly on the hunt for Discount Codes for Barcelo Hotels to help you with your money saving. Our experts check dozens of sites for secret codes including NHS discounts, student sites & social media channels saving you time & money!